As soccer players continue to get more explosive and fast, so does the entire referee crew. Head referees (referees) and assistant referees (assistants) need to be able to keep up with play in all facets of the game, from breakaway counterattacks to high-speed slide tackles, referees and assistants need to physically capable of putting themselves in the best positions to have the best opportunity of getting the call right. Players and teams are taking advantage of the latest research and cutting-edge methods to improve their explosiveness (power), acceleration and linear speed (sprinting), repeated sprint ability (RSA), and change of direction ability. Referee organizations must educate their members on the importance of each quality on crew performance and emphasize improving, or at least maintaining, them year-round via consistent testing and training. 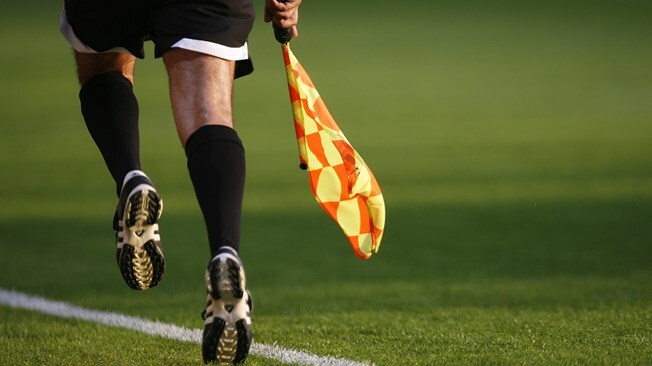 For a quick synopsis of why sprint training is necessary for all athletes – yes, that includes soccer referees – check out Mike Young’s blog (1). In this blog, I’ll discuss how FIFA assesses linear speed, the impact of sprint training, and why officials should sprint year-round. As previously discussed in part 2, the Interval Test is arguably the most important and most grueling aspect of the physical fitness test (PFT). However, the RSA portion of the PFT is indispensable and must be taken seriously in order for the referee crew to pass and be considered match-ready. Only the 40-m RSA test (Figure 1.) is administered for all crew members at the sub-elite levels and has been shown to be a valid assessment of referees and predictor of physical match performance (2). At the elite level, assistants take a separate test – the 30-m RSA Test (Figure 2.). Participants run six consecutive 40-meter sprints followed by a recovery period after each sprint (while walking back to the start line). Dynamic start with the front foot on a line that is 1.5 meters away from the electronic timing gates at the starting position. The ‘start’ gate is placed at 0m and the ‘finish’ gate at 40m. The ‘start line’ is marked out 1.5m before the ‘start’ gate. Referees line up at the start with their front foot touching the ‘start line’. Once the test leader signals that ready, the referee is free to start. Referees receive a maximum of 60 seconds recovery between each of the 6 x 40m sprints. During recovery, referees must walk back to the start. If a referee falls or trips, they should be given an additional trial (one trial = 1 x 40 m). If a referee fails one trial out of the six, they should be given a seventh trial immediately after the sixth trial. If they fail two trials out of seven, the match official has failed the test. The maximum allowed time for each sprint is 9.0 seconds. Assistant referees run five consecutive 30 meter sprints followed by a recovery period after each sprint (while walking back to the start line). The ‘start’ gate is placed at 0m and the ‘finish’ gate at 30m. The ‘start line’ is marked out 1.5m before the ‘start’ gate. Assistant referees line up at the start with their front foot touching the ‘start line’. Once the test leader signals ready, the assistant referee is free to start. Assistant referees receive a maximum of 30 seconds recovery between each of the 5 x 30m sprints. During recovery, assistant referees must walk back to the start. If an assistant referee falls or trips, they should be given an extra trial (one trial = 1 x 30 m). If an assistant referee fails one trial out of the five, they should be given a sixth trial immediately after the fifth trial. If they fail two trials out of six, the match official has failed the test. Most notably for the referee crew, sprint training improves the ability to run fast. While that may seem overly simplistic, it is important to remember the principle of specificity and that in order to run faster, one must run fast. Although referees and assistants may never need to run as fast as possible, increases in acceleration and top speed will enable them to position themselves sooner to make the right call. The referee that sprints in training will be better capable of sticking with the play during a quick counterattack that pits one attacker against one defender – a “match-critical” moment that can give any referee a nightmare if they are not in the best position to see what foul may occur. With 60-90+ minutes of gameplay, depending on the level, only one official stoppage in play, and no opportunities to be substituted, it’s obvious that referee crews need to be aerobically fit and capable of running long distances. However, what is interesting is that sprint training, even as short as 10-meters, can help in improving athlete’s endurance by improving running economy (3). This means referees and assistants that sprint train need less oxygen to run at lower speeds, which is the case of most of the game. Similarly, these sprint trained crew members will also have a greater speed reserve and use less energy when running at a submaximal speed. This energy conservation is important as studies have shown that sprint performance decreases towards the end of the game, which may affect their ability to keep up with play, particularly with assistant referees (4). Sprint training is also important to sub-elite referees and assistants as they tend to officiate multiple games during the week and, often, the same day. With a better running economy and higher speed reserve, these officials will be better capable of withstanding the fatigue of multi-game weeks and days. No matter the level, sprint training is necessary for all referee crews and will only improve their match readiness and performance. However, are we sure that the amount and intensity of sprints that occur in the game are enough to improve, let alone maintain, linear speed capacities of the entire referee crew? This is an even more rhetorical question as we look at officials at lower levels who hardly experience the high-level intensity of match play at the elite level and most likely are not sprinting enough to further improve their linear speed. On the other hand, elite level crews are only officiating one game per week, which will not provide enough sprint stimulus to improve speed. So, it is vital for referees and assistants at all levels to do at least some amount of sprint training during the off-season and in-season. Since it is well-established referees most closely resemble midfielders in the physical demands of match performances and several studies show the merit of in-season sprint training for soccer players, referee crews should also sprint train in-season in order to maintain or improve speed (5, 6). Sprint training for officials will vary greatly depending on the schedule, level, and intensity of their matches. Those at the elite level may need more sprint training to get adequate stimulus, while sub-elite referees may need less – IF they are getting enough in matches. How does one know? That is virtually impossible to know for certain, but it is safe to assume that all referees need to follow a sprinting program that provides the necessary amount of sprinting to maintain or improve speed. While the particular frequency of sprints will vary greatly on the need of the official, the sprinting volume for a training session can be approximately equal. A general rule for sprint volume I like to use, from a lecture by Mike Young, is 200-360 meters (for improving acceleration) and 200-300 meters (for improving top speed) (7). With that being said, younger, more novice (less training history), or slower officials can typically handle a bit more sprint volume as opposed to older, more experienced (greater training history), or faster officials may need a little less volume. This is because as an individual sprints faster, it inherently becomes more intense on the body due to the multiple factors, i.e. neuromuscular overload, increased intramuscular and ground reaction forces, tendon elasticity, etc. This demands maximal intent from the athlete, so referee crews desiring to incorporate sprint training must remember the first rule of sprinting – SPRINT! Go fast and don’t slow down during the repetition. For more ideas and examples of sprint training, here is a list of workouts from US Soccer Referee Department (8). Remember, sprinting is a very potent exercise and should be used with a minimal-effective dosage and NOT beyond the point of diminishing returns. Also, adequate muscular and tendon strength, especially during the eccentric muscular phase, is necessary prior to sprinting, so strength and plyometric training are vital to the health and performance of the athlete. The importance and benefits of strength training and plyometrics for soccer referees is a topic for another time. Be on the lookout for my upcoming blog about the pros and cons of the FIFA CODA test for Assistant Referees, the importance of change of direction ability (CODA) and agility, and what referee crews can do to train CODA and agility.